Competition time’s over folks and we have a winner! Congratulations to Vicky Haddock who wins our fabulous Dean’s Luxury Hamper. Have you entered our fabulous prize draw yet? 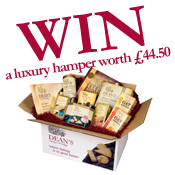 We’re offering one lucky person the chance to win a Dean’s Luxury Hamper, worth £44.50.